The Miami Heat couldn’t get the win over the Golden State Warriors on Sunday night, but even after the loss Dwyane Wade was in a giving mood. 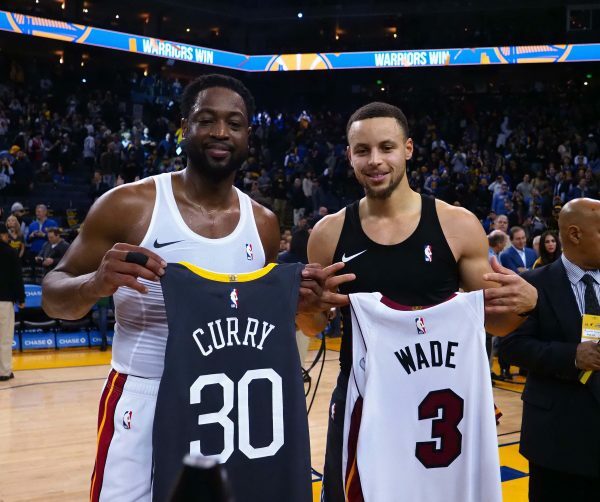 Following the Heat’s game against the defending champions, Wade continued his season-long tradition of swapping jerseys by trading uniforms with former MVP Stephen Curry. It was no surprise that Wade traded jerseys with Curry, but it was still great to see one of the game’s biggest current stars so elated to get his hands on a No. 3 jersey of his very own. Wade and the Heat nearly got the win over the Warriors on Sunday night and led with under a minute in the game. The Warriors proved why they’re the class of the NBA, however, and managed to score the game’s final five points to eke out the win, 120-118. Wade and the Heat will get the chance to avenge Sunday’s loss when Curry and the Warriors come to South Florida later this month on Feb. 27.